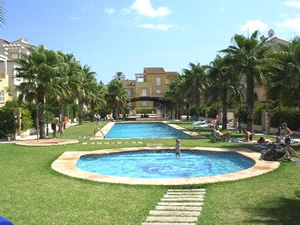 Apartments in Javea are available mainly in the Port and Arenal areas of Javea. Which makes them in prime location with shops, restaurants and beaches within walking distance. Due to strict building regulations there are a minimum amount of high rise blocks of apartments in Javea with most buildings not exceeding four floors. Apartments in Javea are to be found in many variants, the older more typically spanish apartments will often have prime locations metres from the beaches, though they may not have some more modern, or luxury conveniences such as lift access etc. 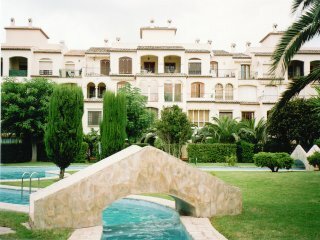 The modern apartments in Javea being developed are to a considerably high standard, with lush areas of green and palm tree avenues for pedestrians between the buildings. There is a real investment of planting and green areas to seperate the buildings and ensure that Javea withholds its natural beauty and doesn’t become a concrete jungle. Resulting in clean, modern and elegant apartment in Javea developments with lush recreational areas, often with large communal swimming pools, tennis courts and gym facilities. Some Apartments in Javea along the Arenal Small Boat Marina even feature their own private boat mooring spaces. Certain developments have gated access, so the entire facility and its communal grounds are secured with swipe key access. Making it safer to let your children enjoy the communal areas and keeping your apartment safe from burglars. When buying an apartment in Javea it is important to understand the maintenance costs for any green areas of off street parking. Most apartments feature underground or shaded parking spaces, and a communal swimming pool. It is usual to incur a small monthly or yearly fee for upkeep of the facilities and maintenance staff. Whatever you are looking for, apartments in Javea are ideal for living and holiday rental because of their easy maintenance and close proximity to the restaurants, bars, shops and beaches of Javea. Please view our Apartments for sale in Javea or if you have any questions or need further advice and guidance please contact us.